Praveen Siddannavar's Blog: The Power Of Striped Cat & The Macho! As winter approaches, challenges are faced on various fronts due to fog, the flights invariably get delayed, driving on highways becomes tedious and for wildlife/bird photographers it is a mixed feeling and most of time we aren’t sure if mist and fog can be in our favor or against us. 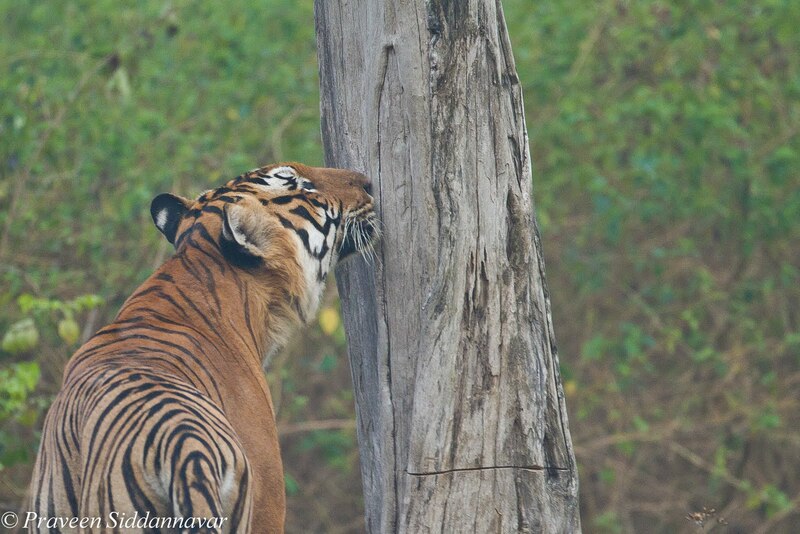 Such was a morning game drive at Bandipur Tiger Reserve, mist covers all around the park. I had one of my favorite and luckiest drivers of all of times Kiran of JLR Bandipur, a young lad but who has loads of experiences in these jungles. We started the drive a bit late expecting the mist to clear, but it never changed so we decided to move on. Our entry was through chicka surle katte and as we drove on the main surle katte road, we saw two safari jeeps ahead of us; one took left towards mulapura water hole and the other on to right that leads to other part of the forest via arale katte towards yera katte. We had a choice to follow either of these jeeps or to drive straight on the track, that’s leads to one of the most difficult hilly terrains referred to as “Bettada Katte”, Kiran our driver looked at me and was expecting me to make a decision, I pointed my hand towards bettada katte. As mentioned this is a hilly area, obviously kiran was very cautious to drive slowly on this route, otherwise also he is a slow driver. I was with him in the front seat, due to fog, the mist formed was affecting our view, kiran had to stop the jeep a couple of times and clean the windshield with a cloth as the wipers weren’t helping much. The visibility was getting even worse as we drove higher altitude. It was past 7am; at one point suddenly I heard an alarm call by langur (Black Faced Monkey). We stopped and could see the monkey sitting high up on a tree, the calls went loud and we all sensed a predator is around. Alarm calls are directly proportional to excitement, the louder the calls more is our excitement and this happens despite one has been to forests all his life and has been spotting tigers and leopards. Alarm calls especially by langurs are accurate, since they have the best view to spot a predator sitting high up on a tree. And I was now sure that this guy had spotted a predator, possibly a tiger or a leopard. Due dense mist we were unable to see anything so I asked kiran to drive further and suddenly from a distance I see something moving on the track. It’s a tiger I whispered; a huge male not bothered about our presence and was casually walking up the hill. By now I had made some amazing shots of this cat walking, however all shots were the rear view. 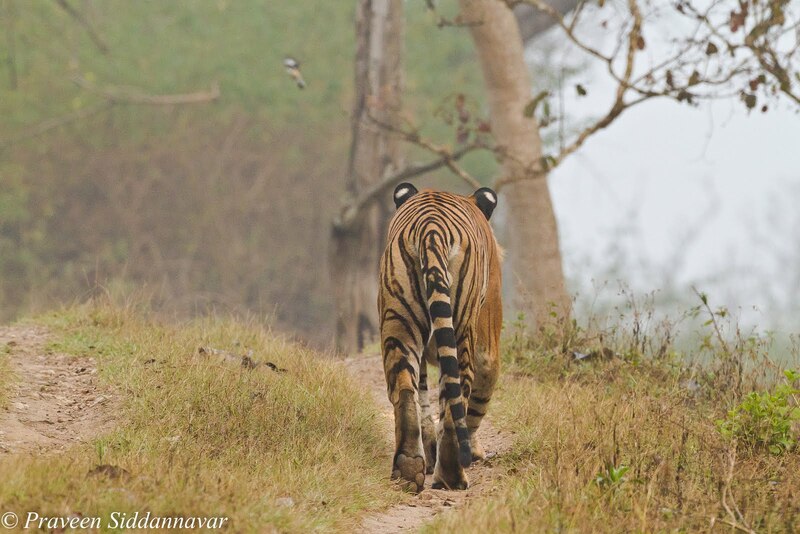 We stopped and followed again and this repeated for a while but the tiger never turned or even looked back. To our luck the mist was sort of clearing up, but our patience was put on the highest level of test. 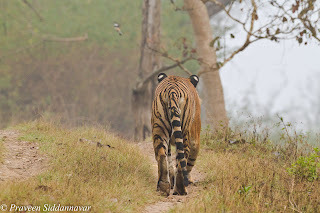 Finally after 5 minutes or the tiger stopped, looked around and posed, to my bad luck I missed the shot and so did my friends because our jeep was in motion and kiran braked suddenly when the tiger turned. Our shots went off blur due to the jerk. 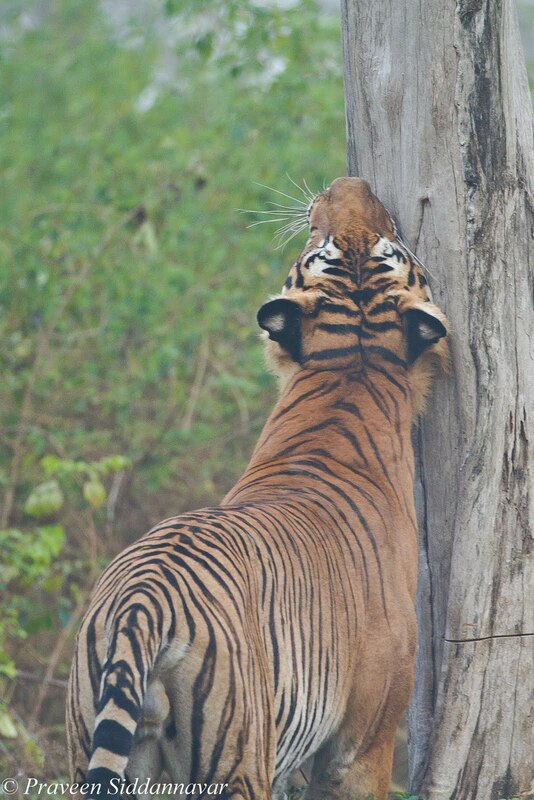 We continued to follow this cat and noticed that he is scent mark his territory by urinating on the several tree trunks, but the sad part was we still didn’t manage to get a single shot of his face. 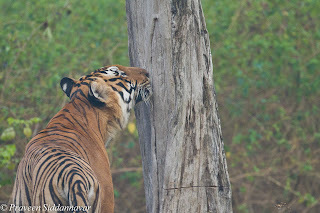 We didn’t give up, kiran too realized our frustration and drove further, however the good thing was we gave enough space to the tiger and that’s one reason he didn’t disappear into the bushes. Finally he stops on a bit elevated terrain, we were still on the low sloppy track and he turned a bit. Oh boy! 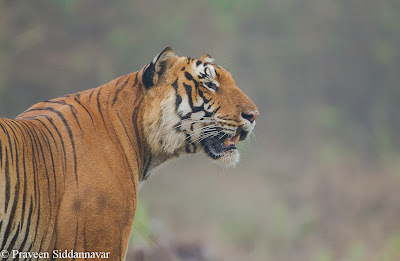 This was a very unique posture, showing all his might, glory and typical power of the striped cats, and to add to the beauty was the misty background. Our sighting didn’t end here we drove back to surle katte and had an encounter with a large bull elephant and it turned out to be a “Makna”. Bull Elephants (Male) with tusks are called "Tuskers". Bulls without tusks are called "Makna". Maknas are a rare sight in Indian forests, 1 in 1000 elephants born will probably be a Makha. 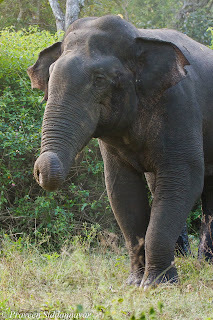 Maknas have a reputation for being more dangerous, aggressive and cunning than tuskers amongst elephant family, like tuskers they too are solitary. Maknas are recognizable only by their bull-like built. From a distance they can be mistaken for cow elephants. Another thing I noticed which approaching towards this elephant, that he is in Musth, I cautioned Kiran that we need to be extra careful. As we drove closer, this guy charged at us like mad, he takes no nonsense and means only business. The impact of charge is so much that many of us forget to photograph, however I managed few shots using Canon EOS 40D and 100-400mm lens, ideally a wider angle lens would have been good. Musth is a condition when temporal gland between the eyes and ears swell and discharge a viscous aromatic secretion. 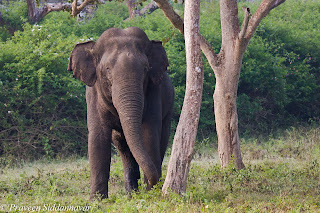 When a male elephant reaches the age of 20, he starts to come into this phase of Musth which prepares him for the intense competition for females and mating rights. Musth might last up to 60 days as they wander looking for females in the forest. Also during this condition they constantly urinate, signaling other elephants of his state. 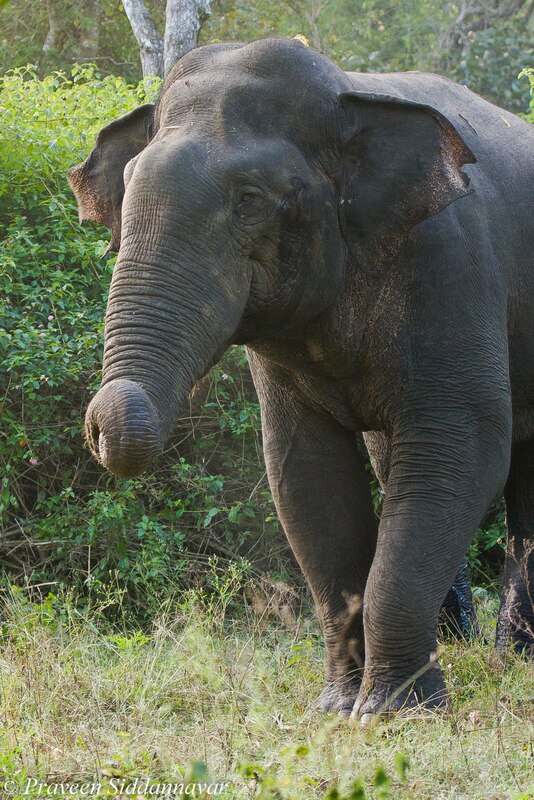 The musth condition can be noticed in the images attached. If you ever come across Maknas ensure that you maintain silence and more importantly keep safe distance. After taking few shots, we drove off quietly and left the Makna alone.